Healthy Land and Water teams up with the local community in an attempt to protect the endangered carronia vine and pink underwing moth. 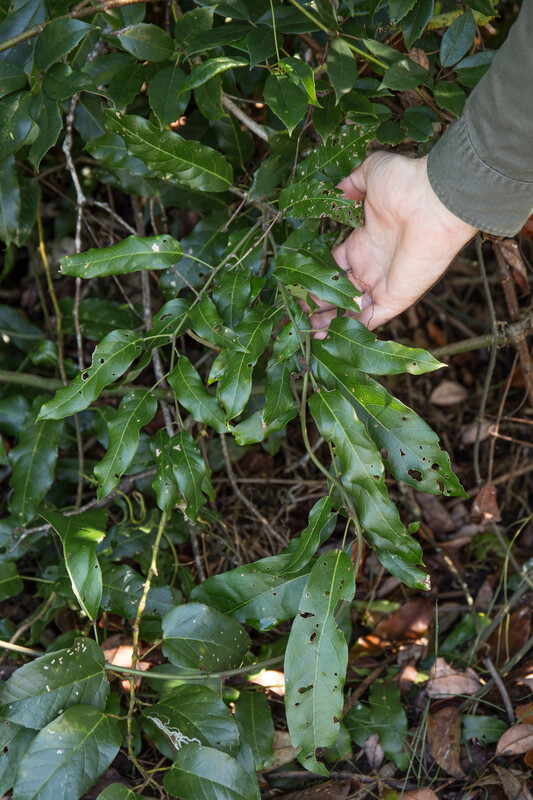 In partnership with Sunshine Coast Regional Council and the National Landcare Program, Healthy Land and Water launched the Carronia Vine Restoration project in 2017 within a section of the Cahill’s Scrub Bushland Reserve on the Sunshine Coast. Since then, project leaders and local bushcare group, the Friends of Cahill’s Scrub (FOCS), have been working tirelessly to protect and improve the natural regeneration of the threatened carronia vine, a native climber that acts as a food source and supports the breeding grounds for the rare and endangered pink underwing moth. The endangered carronia vine is a large woody climber endemic to Queensland that grows in deep soils made up of basalt or granite. Originally found in only three small rainforest patches in the Cairns region, the vine has become more widespread reaching as far south as the Sunshine Coast yet faces ongoing threats of disturbance and habitat loss. To support the recovery of the precious vine, the restoration project has focused on removing noxious weeds from the site, repairing damaged sections of the habitat caused by illegal dumping, and revegetating the reserve with local native rainforest species. Additionally, the project has attempted to increase the population numbers of the pink underwing moth since known numbers of the species have declined since it was first identified in 1973. Habitat loss and weed infestation has been the cause behind the species’ rarity, elusiveness and endangerment. Nowadays, the moth is occasionally found in tiny pockets of lowland subtropical rainforest in northern New South Wales and South East Queensland. Maturing larvae can be easily spotted thanks to their intimidating head display which is used to ward off predators, while fully matured moths are recognisable by their bright pink wing spots. Ongoing selective weed control and the maintenance of habitat values of the ecological community has been a testament to FOCS’s endless devotion to safeguarding and enhancing a precious section of South East Queensland’s subtropical rainforest. Once the project was completed in May 2018, FOCS and Sunshine Coast regional Council organised a community field day to highlight achievements, encourage future involvement in restoration projects and raise awareness of the importance of protecting and improving our natural environment.